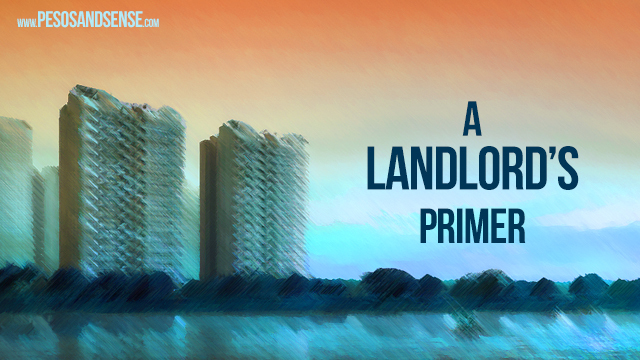 For many Filipinos, especially OFW’s, the idea of buying properties like condos is very attractive. The image of just waiting in your house for your tenants to pay their rent sure beats having to struggle for a paycheck in a foreign country. That being said, based on conversations and emails I have received from many people, it seems that quite a number of us really have little idea as to what being a landlord actually entails. Hence, if you are considering buying a condo or house with the intention of renting it out, here are some things you should know BEFORE you fork over any money. It should go without saying that you should know if you can actually afford ALL the payments for your property. Remember, you are committing your money for the next five years or more in many cases so are you absolutely sure you can pay? The loan may be 0% interest now but I am pretty certain it won’t be in a few years. How am I certain? Well, the BSP itself has been sending signals that they will raise their interest rates and when those rates go up, mortgage rates WILL follow. By the way, who really decided that you can afford the payments? You or the agent? Any “investment” should have an identified Return-on-investment or ROI. This amount should reflect the risk you are taking and should at the very MINIMUM, beat inflation. So, when you buy that condo, how much money do you expect to make? If you don’t know this number, how do you know how much to rent it out for? Marami kasi, ang attitude eh, “Bahala na” tapos magugulat pag malugi. And to PROPERLY calculate for your ROI, you will need to know what your RECURRING costs will be. What recurring costs? Well, real-estate taxes for one. As a property owner, you are required to pay taxes to retain ownership of your condo / house / land every year. How much? That would depend on the location of your property as well as what kind of property it is. Then there are the association dues that either you or tenant will have to pay and again, those figures will have to be factored into your calculations for your ROI. Lastly, there will be maintenance costs that will be incurred when the property is vacant as well as when it is occupied. Depending on the specific terms of the contract, certain maintenance costs will still be shouldered by the owner. Looks intimidating doesn’t it? Well, it is – especially if you have no idea what you are getting into. Which is why, we will be posting more of these in the coming days so stay tuned. And as we progress, we will post more detailed examples. As always, feel free to like and share. Is metro manila still a liveable place for the people to spend blindly on condos? Haha. Floods, traffic, pollution, crimes and still the property prices here are rising? Cant blame the people as most jobs are here in the metro. Id rather buy a lot outside metro manila for my retirement. Sir Aya what can you advise people without any experience who want to get into real estate investing in particular? How/where should they acquire the knowledge to be successful in real estate? Kasi parang mahirap mag-self study pag dating sa ganito. Many real-estate boards conduct seminars on this. Thanks sir Aya. Nasagot niyo na din pala ito sa Facebook. Thanks po! hi, sir aya. Im going my vacation by 3rd week of december until 3rd. Week of january. Do you have any schedule for seminar during this period? I want to attend your simenar if you have. Thanks! Malabo sa December pero almost sure sa January. I did invest some of my earning in condo particularly at the University belt area. For now I don’t have much problem renting it out – for sure it is not easy as what your real estate broker told you but if you have your plan laid-out beforehand in order to benefit on this kind of business. Condo rental for me is as good source of passive income generator once you known the in-and-outs. How I wish I read this before when I bought a condo 2 years agó. I must say that I was ignorant way back then. My thinking before is I wanted an investment that’s why I entered real estate. Instead of putting the money that I paid for DP, better if I put it on UITF or mutual fund.